Darshan means 'divine sight': the experience of seeing and being seen by the Divine. The Darshan experience with Paramahamsa Vishwananda also includes a hands-on blessing. 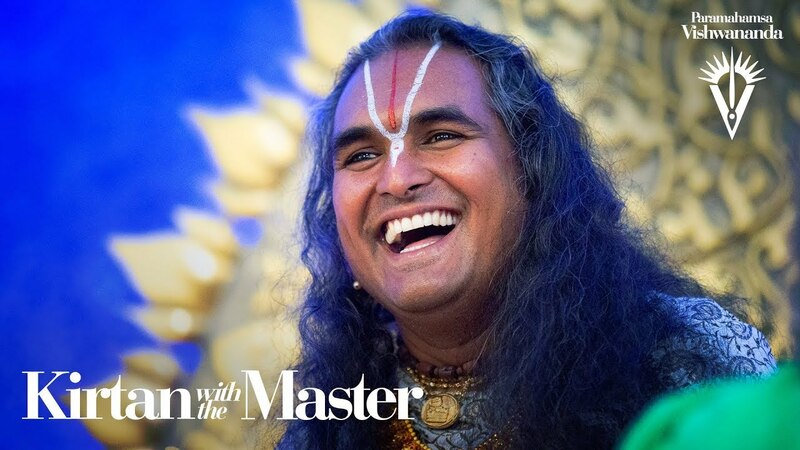 Receiving Darshan from a fully-Realised Master who lives in constant union with the Divine is a rare and special event, and Darshan with Paramahamsa Vishwananda is a personal experience that no one should miss. The moment of Darshan is unique: it's just between you and Him. As He looks into your eyes, Paramahamsa Vishwananda showers unconditional Divine Love upon you. He often says that He is cleaning off dust and dirt from the mirror of your soul, so that you can reflect the light of God more and more. Each one receives something different, perfectly designed for them. When you come for Darshan, when I look at your soul at that moment, what I see is your Self, your True Self. And what I see is the beauty of what you hold inside of you. That’s what I want you to see and that’s what I want you to realise for yourself. If you would like to attend a Darshan please register in advance. Darshans at Shree Peetha Nilaya fill up very quickly, but cancellations often arise, so check back frequently. Paramahamsa Vishwananda often sings kirtan with the audience just before He begins a Darshan. The series ‘Kirtan with the Master’ features these special kirtans from the most recent Darshans held at The Ashram—Shree Peetha Nilaya. While it may seem like He is simply putting His hand on your head and looking into your eyes, in reality, He is looking at the exquisite beauty of your soul and planting the seeds for unconditional love to blossom in your heart. What is the purpose of Darshan? Darshan gives you a glimpse of the Divine; each Darshan helps clear the path for you to move closer to that goal. What do I get from Darshan? For some, it’s a blessing. For some, it’s a transformation. For some, it’s a healing. But, above all, it is a sharing of Love. Darshan is purifying; anything can happen. Each person’s experience will be unique to them in that moment. Whether you feel something profound, or nothing at all, something deep inside of you is being touched, whether you realise it or not. What do I do during Darshan? Really, there is nothing for you to do during your personal Darshan except enjoy the moment. It is a time to immerse yourself in the whole experience. Paramahamsa Vishwananda only sees the best in people and loves all equally, so there is no need to try to hide or pretend to be anything other than who you are. The Darshan experience lasts several hours. In addition to your personal hands-on blessing from Paramahamsa Vishwananda, you are invited to stay and enjoy hours of singing and dancing to devotional bhajans and listening to inspirational stories from other guests. Darshan is a festive occasion; colourful, modest dress is recommended. Remember you are coming to meet the Divine, so please dress nicely. In general, colour is always nice. Traditional Indian dress is welcomed, but not required. Women tend to wear long skirts and modest necklines, and men wear nice trousers and shirts. Shorts, tight pants and low-cut shirts are not appropriate. Darshan events are open to everyone. There are no restrictions, all are invited regardless of faith or tradition. There is no charge to receive the blessing, however, donations are always welcomed.